Despite the terrible storm that came close, we were spared and got only rain. 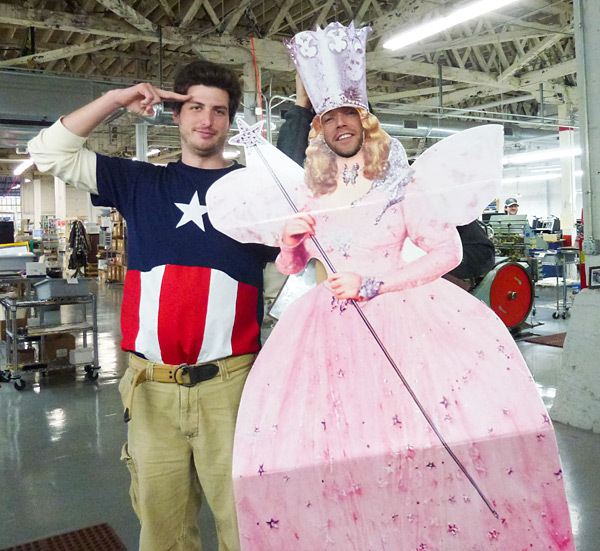 Halloween brought fun, more damp weather, a bad ole witch, 2 good witches and an american hero! 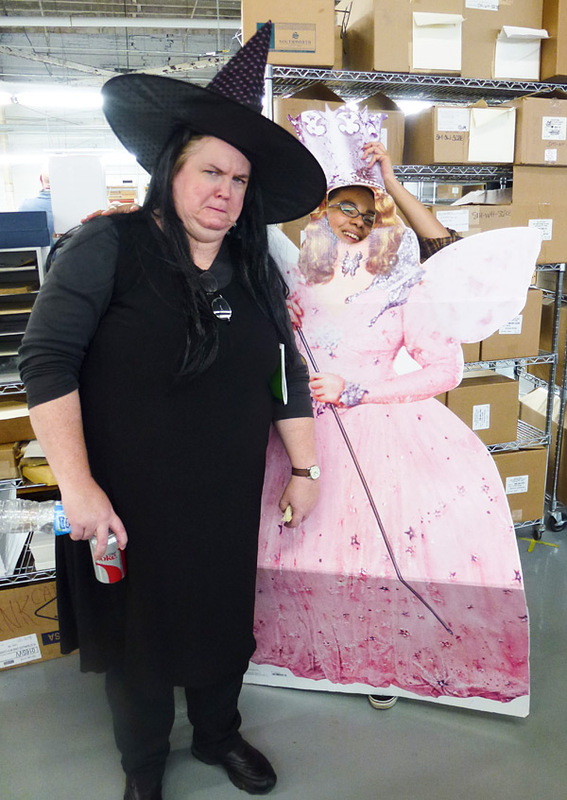 No bystanders in the shop were harmed or terribly frightened by ghouls or goblins. 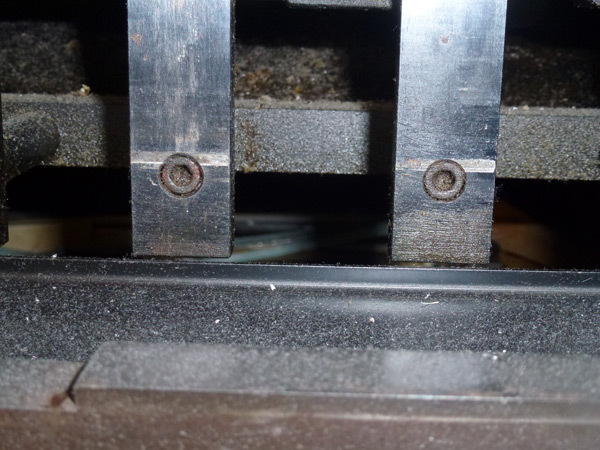 When diecutting shapes, a metal jacket is used on the platen instead of oiled tympan paper. 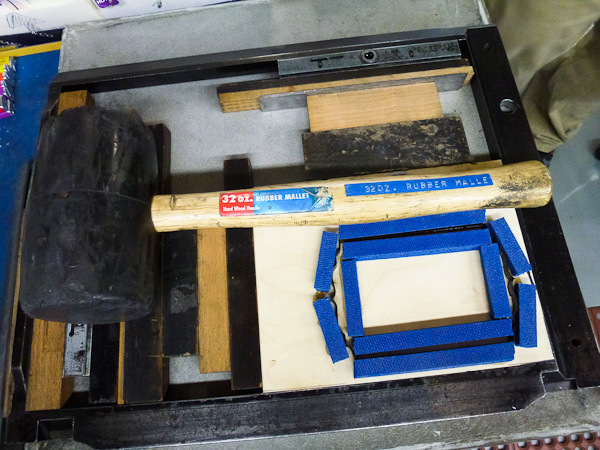 This protects the press from the sharp cutting edges of a die. To coax the jacket and its springy clips into place, sometimes we use a mighty “32 oz Rubber Mallet” to tap it into place. Tap, tap with the mallet’s wide surface area and the jacket is locked in and ready to start getting in position. Wielding this 32oz rubber mallet makes me feel like Thor. 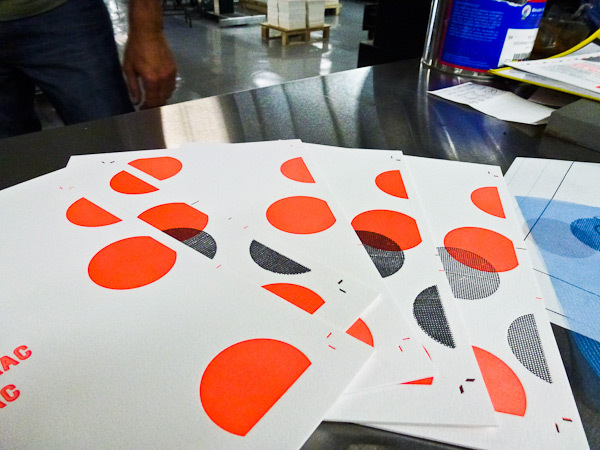 We put together a stack of eye-popping set-up sheets with layers and layers of our neon Day-glo ink that had been run through the press several times. The glowing result became a light source of its own! This is the Bella Figura design Polka Stripe designed by Erin Jang. It is a design meant for Great Fun! Say Hi to Phil and the back of Lou! On Phil’s press was the most magical shade of blue that I couldn’t stop looking at. 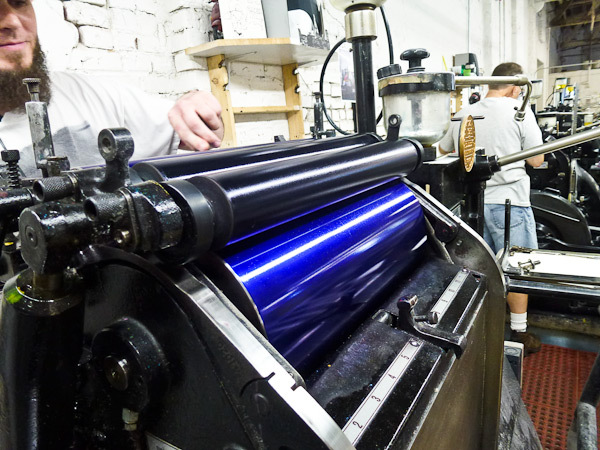 As the drum roller spun, the ink looked like blue velvet, so mesmerizing. 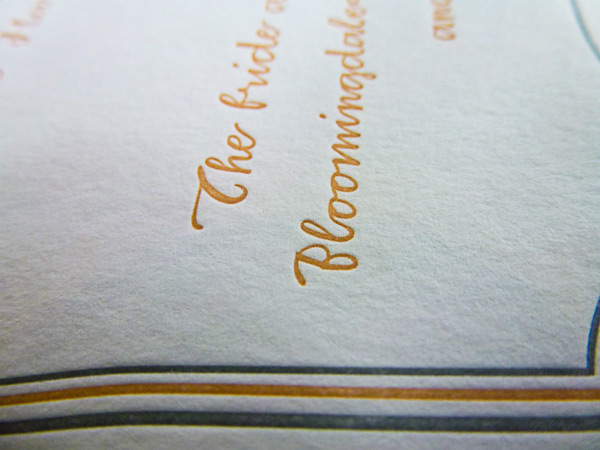 A common downfall of new printers using light colored inks is thinking the print will be the same color as how the ink looks in the can. 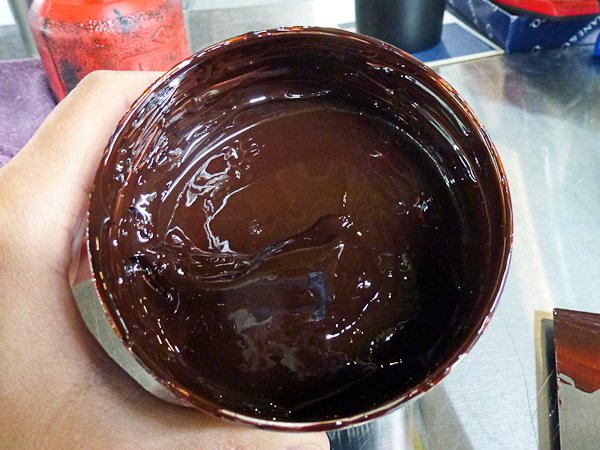 Here is a can of nice deep rust orange ink but it is actually meant to be a light apricot color. 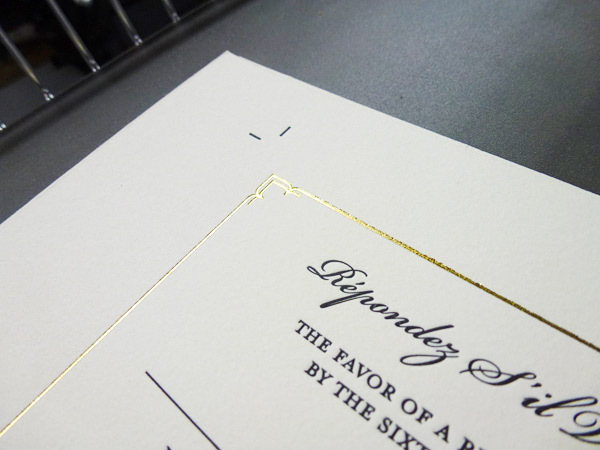 When applying an unfamiliar ink to your press, use a small amount and work your way up to color. That is much easier than having to wipe ink off and possibly put lintballs from a rag on the ink drum or disc. If you do have way too much ink on, it’s less trouble to simply wash up and start over. There is never an end to learning more press tricks! 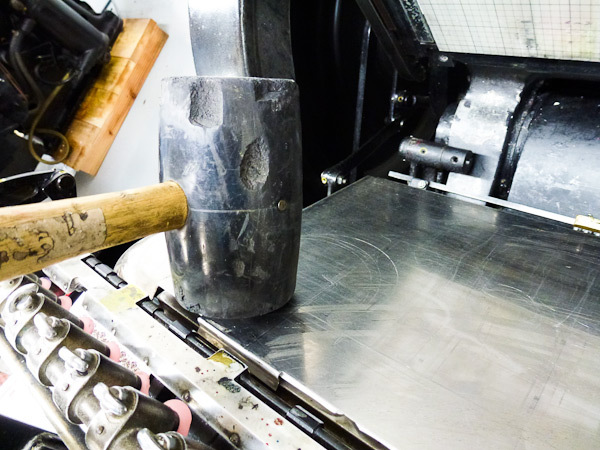 A Day in our Letterpress Shop: Have you seen this on a Heidelberg Windmill? 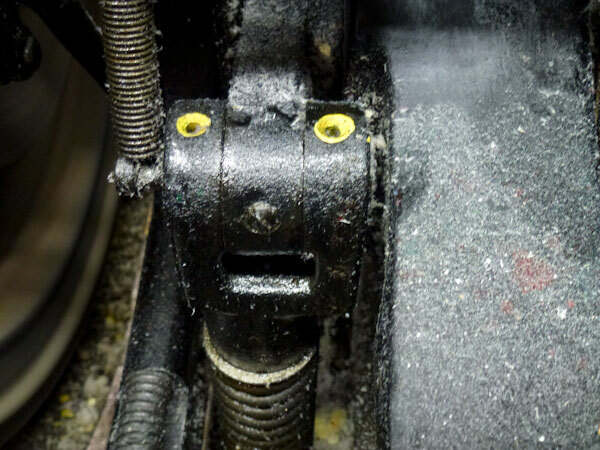 Thanks to printer Tim for pointing out this other face of the fascinating press we work on. What a charming companion to look down and see! 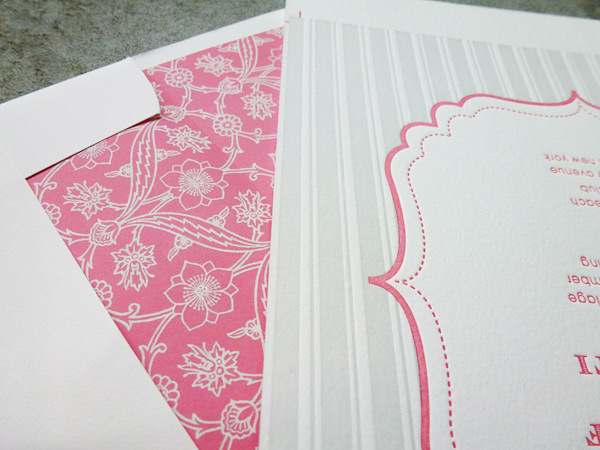 Here is a particularly lovely version of Bella Figura‘s design Simple Frame printed in Watermelon and Pale Gray inks with matching envelope liner in the Simple Lace Pattern. Together these pieces are Simply Stunning! 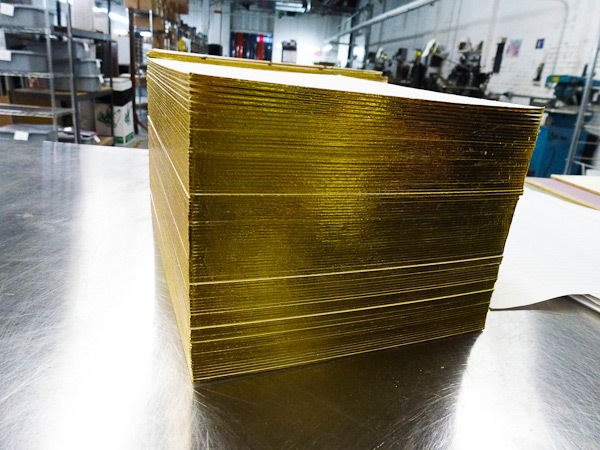 Here stands a beautiful stack of foil edged cards, so brilliant and distinctive. Truly these are a treasure made to be shared as each piece is passed on to the lucky receiver.